Why do millions of people become scuba divers? It might be for the abundance of marine life you can observe underwater, or it might be for wanting to feel like an astronaut in a totally different world? Or maybe it’s to meet new friends practicing this exciting adventure? You may have your own reasons as well, and all of those beautiful reasons reunite us all for one common passion – learning to scuba dive! So if your wish is the same, then the PADI Open Water course is designed just for you! Who is this diving course for? If you are 10 years old or more, you have basic swimming skills, and you are in good physical health: You can apply for the PADI Open Water course. There are no other requirements or any prior experience needed. PADI is the largest recreational diving organization in the world. Its pedagogic lessons make the courses efficient, easy, safe and fun. Our PADI instructors do their best to teach you good habits and skills, so you can be confident and at ease while underwater. Diving with us will make your first diving course one of the best experiences you’ll ever have. Our slow and long dives is our trademark in El Nido, Palawan. Our instructor's priority is to stay focus on safety, buoyancy skills, and your comfort at all time. Just imagine the amazing underwater world awaiting for you in the waters of El Nido… All our scuba divers return from their trips extremely pleased of their dives with us. 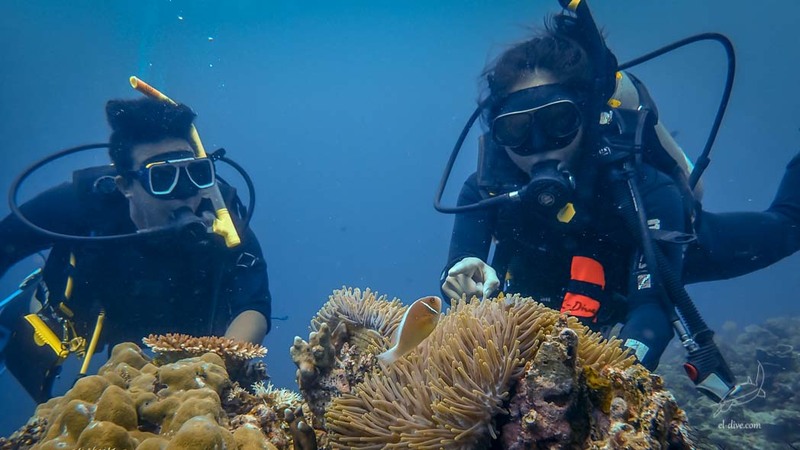 Being a small dive center, we provide a personalized service to all of our guests and we bring you to the best dive sites of the Bacuit Bay, which of course will depend on the weather conditions and your needs for the course. We are proud to be different than other dive centers and should you want to read more about us, feel free to check our excellent reviews on the web. 2 students maximum per instructor - so we can provide safe, quality and cozy dives. Long, relaxed dives in order to explore the maximum during the course. The classic schedule to get the Open Water certificate is a three day course. Once you have decided to book your PADI Open Water course with El Dive, you will immediately receive the PADI materials which allows you to start the theory studies using a manual and a DVD (you can borrow our DVD player/screen). In the PADI book and in the DVD movies, there are 5 sections to complete. Theory is a very important part of the course. At some point during the afternoon, you will meet your PADI instructor for a 2 hour class. He/she will make sure you understood the basics, and will review the important stuff, such as equipment, physics, safety, aquatic life, and more! Once you’ve completed this class, you are able to go into the water on the next day. In the next morning, you and your instructor meet at the dive centre. You get prepared, and then slowly go on the boat. Each time before entering the water, you will get a clear briefing about the lessons. The pedagogy is one of our priorities, in order to make you enjoy the best of your underwater exploration. During the day, you will complete a sequence of skills in a confined area. Then you will go for two relaxing open water dives, one before and one after a big lunch on our boat. Those 2 first dives are limited to 12 meters deep, you will observe lots of aquatic life such as turtles, anemone fish, pufferfish, batfish, trumpetfish, angelfish, butterflyfish, triggerfish, etc, all very colorful and all swimming smoothly around the vivid coral reefs. The lunch is a big part of our day as well. We provide delicious and fresh food we get from the market in the early morning. A great meal which will give you all the energy you’ll need for your diving day. After diving, once we are back in town, you will have another class to finish the two last sections of the PADI materials. The diving schedule of this day is similar to the previous one. You will practice others skills in our confined water area. Then you will go diving for another two open water dives, practicing a few skills you already know, and exploring the best of the dive sites up to 18 meters deep. When you come back to the diving centre, you will do the final exam. And if you pass all the requirements, you will then be certified as a PADI Open water diver, and be able to dive all around the world. Then, you can eventually think about the next step: more dives, or the PADI Advanced Open Water course. Hi do you have availability for an Open Water Course from 31/12-2/1/18. Also if you have recommendations for accommodation too, that would be great? El Dive schedules courses and fun dives everyday of the year. However, the only day in year that the diving centre is closed is on the 1st of January. Kindly ask in the contact form in order to arrange something directly with the management of the dive centre, and get more details of the schedules.